Emily Murase with family and friends during her re-election campaign. SAN FRANCISCO — Emily Murase, who was re-elected to the San Francisco Board of Education, was unanimously chosen as the board’s new president on Jan. 13. Murase said in a Facebook post, “Tonight’s school board meeting was momentous. One of the first orders of business was to elect officers. I am very pleased to be your new school board president! “Good evening! I want to thank my colleagues for their support. “I also want to give a shout-out to my lifelong mentors and teachers. Many of you know that I am a graduate of San Francisco public schools, K-12. “To the late Don Earlenbaugh, whom we lost last year. He was my phenomenal third-grade teacher at Alamo/Golden Gate who took us to the opera, the Japanese tea ceremony, and staged a production of Gilbert & Sullivan’s ‘HMS Pinafore,’ with a bunch of third-graders! “And to my high school French teacher at Lowell, Joan-Marie Shelley, who instilled in me a sense of civic duty and leadership. “And to my high school English teacher, the incomparable Flossie Lewis, who made us fall madly in love with Shakespeare. “As president, I have some very big shoes to fill. From President Mendoza-McDonnell, to President (Rachel) Norton, to President (Sandra Lee) Fewer, the board has enjoyed a full roster of strong presidents. “I want to thank President Fewer for her leadership over the past year, much of which was dedicated to the broad strategic planning effort called Vision 2025, launched initially by President Norton, where, in collaboration with our partners, we were asked to ‘reimagine public education in San Francisco for a new generation.’ I encourage everyone to read all about it on our website. Our work in the coming year to implement the Vision will mirror the approach used to develop it: it will be inclusive, interactive, and inspired. “We will look to all of you, families, parents/guardians, teachers, paraprofessionals, nurses, counselors, administrators, central office staff, community, and city partners, and most definitely our students to help shape the education of the future with us. “And we have the perfect superintendent to lead the charge. I look forward to working closely with Superintendent (Richard) Carranza, Vice President Haney, and my colleagues on the board to guide the progress this year towards Vision 2025. Murase, Mendoza-McDonnell and Walton were sworn into office on Jan. 6 at the Tenderloin Community School. Oaths were administered by San Francisco Mayor Edwin Lee, San Francisco Superior Court Judge Gail Dekreon, and State Sen. Isadore Hall III. Murase also serves as executive director of the San Francisco Department on the Status of Women. In partnership with community-based service providers and law enforcement agencies, she has worked toward the elimination of domestic violence homicides in San Francisco. On Jan. 12, Murase was among local leaders who gathered at City Hall to kick off the commemoration of Human Trafficking Awareness Month. She received the San Francisco Collaborative Against Human Trafficking 2015 Modern Day Abolitionist Award. Murase served in the first Clinton White House as director for international economic affairs (1993-1994). 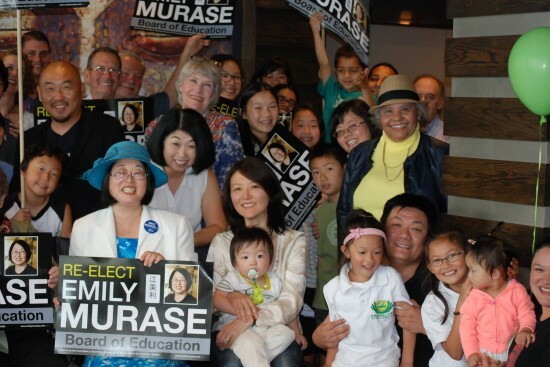 A graduate of San Francisco public schools, Murase and husband Neal Taniguchi have two daughters who attended the district’s Japanese Bilingual Bicultural Program (JBBP) at Rosa Parks Elementary School.